There are certain qualities in individuals which are inherent while others are imbibed. These qualities are not apparent from outside. On examining the fathomless intellect of individuals, one can find a wealth of wisdom, which is reflected in their actions, intellect and caliber in their working environment. These qualities set apart the extraordinary from the ordinary. 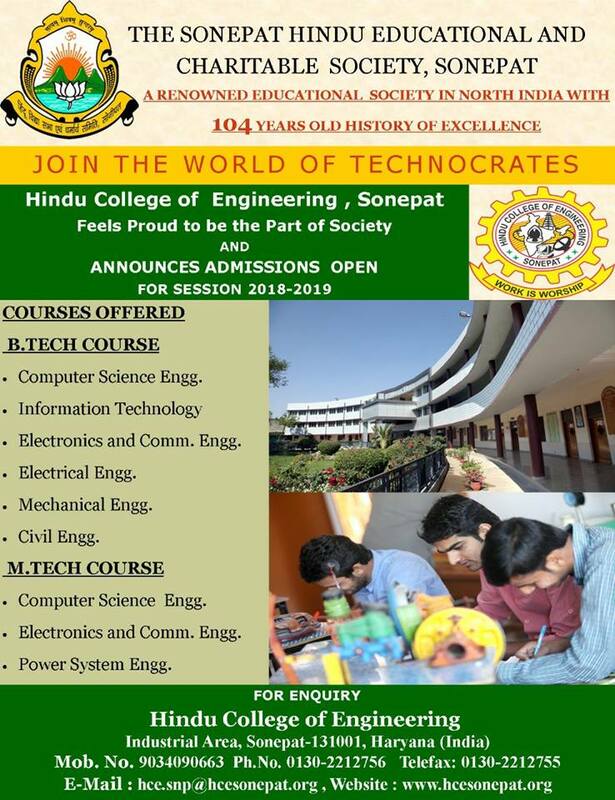 Hindu College of Engineering selects such extraordinary individuals and inculcates in them a unique set of skills, knowledge and experience. The Convener of the Institute is Sh. Devender Kumar Garg, Member, Managing Committee, THE SONEPAT HINDU EDUCATIONAL & CHARITABLE SOCIETY. "Achieve Progress with Merit and Ethics"
To provide quality education by innovation and continuous improvements in the discipline of engineering through advanced method of training, meaningful research and synergy with the industry, business and other institutions in the country and abroad. To provide education that transforms ideas into action, opportunities into global advantages, capabilities into successful careers and dreams into realities. "Learning for Innovation & Quality"
To spread the light of knowledge through formal engineering education, at affordable cost, in the remotest corner of the region so as to generate a vast body of human resources replete with moral values and ethics, capable enough to make a contribution towards the formation of a healthy society and a stronger nation, and to work towards women empowerment through education resulting in the realization of the potential of a large section of society so far neglected and ignored. Quality and innovative education has always been a key factor of the strategy of this college. To create a cadre of professionals who have been imparted specialized skills, who have learnt to consider problems from a broad perspective and who have acquired a heightened sense of moral and social responsibility that their future positions of leadership demand of them. The main objective is to prepare one to go beyond conventional technical skills. The undergraduates and graduates are trained not only to be effective but also to be innovative. The management and staff members are trying their level best to develop the model technical institutes of the country. The continuous and comprehensive improvement is the main concern.